Oh God. So now he's gonna get even better? That’s the MVP. GTFO Harden. DMC put up a cool 21/10 in only 24 minutes. I believe Peja has contacted Steph's lawyer seeking some type of royalty. Grizz sit out Valanciunas, Conley, Bradley and CJ Miles and still get the W over Dallas. They can't out tank them. No disrespect to the Class of 2019, but what does it say when the headliner is Sidney Moncreif? That aside, I said it two years ago, I said it again last year, and I'm going to keep saying it: I don't see Webber getting in, until and unless he makes good with Michigan, and buries the hatchet with the rest of the Fab Five. JaKarr Sampson scored 29 points tonight. Good Dallas won, decreasing chance they keep their pick. With a bit of luck Dallas will send their pick to the East to Atlanta, and Memphis pick will go to Boston. Bit of luck? Dallas is three games "ahead" of Atlanta for the sixth-worst record in the league, with two games to go. Their pick is only Top 5 protected: they literally have to win the lottery (i.e., leapfrog into the Top 3) in order to keep their pick. They went from sole possession of 6th to a tie for 6,7,8,9 That decreases odds of landing top 4. Also the lottery is top 4 now not top 3. Their percentage dropped about 9% of landing top 4 with that win. Well as long as the standings stay even. Yes Washington lost, if we win tonight, both the Pelicans and Washington are in better lottery position now than the Mavs & Memphis. Why are you rooting for the Pelicans to be in better lottery position? Because it makes it more likely that the Memphis & Dallas picks go to the East. Here's how the lotto odds were earlier in the day. 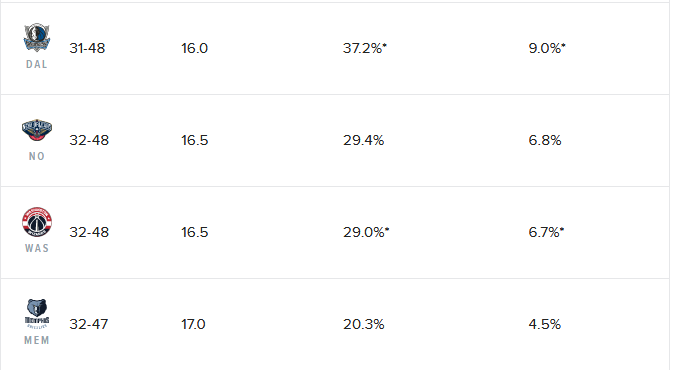 Dallas had sole position of 6th meaning 37.2 percent chance to land top 4 and keep the pick. Later on when we first talked there was a 4 way tie diminishing Dallas odds substantially of landing top 4 leading to a 4 way tie. Then Washington lost after that. Too bad the Kings didn't win tonight too, would of been the best possible odds for both the Memphis & Dallas picks to be sent to the east because Memphis would of been a half game worse (in lotto position) than both too. How about my old friend Bruno learning how to play basketball. Always said we should have kept him. Also Wade and Dirk both balling out in what will probably be the last games.